Star Wars Galactic Necklace | Nerd Much? It should be no secret that we love our nerdy stuff, and that’s why we traverse the deepest depths of the web to bring you the coolest stuff we can find on a daily basis. We have a few sources that we frequent for new Star Wars merch every week, and since today is Force Friday, we’re having a look around to see what’s new. So looky, looky what we found over at ThinkGeek: a Star Wars Galactic Necklace. 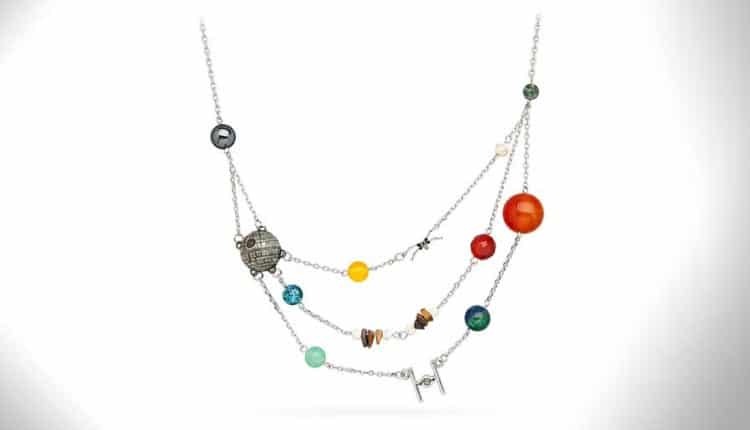 If you’re familiar with ThinkGeek’s stuff, you might remember their Solar Orbit Necklace, a similar design that featured actual planets. That was cool and all, sure, but their Star Wars version of that same necklace is undeniably better. Well, in honor of their love for the Star Wars universe, they’ve created a new necklace that features a few of the galaxy’s most notable planets (nine to be exact), including Coruscant, Alderaan, Hoth, Endor, Dagobah, and more. On top of featuring planets, this Star Wars necklace also features a Tie Fighter, a Death Star, and an X-Wing fighter. The chain is 17″ long and it has a 3″ extender, and it uses actual stones for the planets, including Yellow agate, Hematite, Tiger eye, and more. Best of all is that the necklace actually has a cohesive look, as it doesn’t look shoddy. 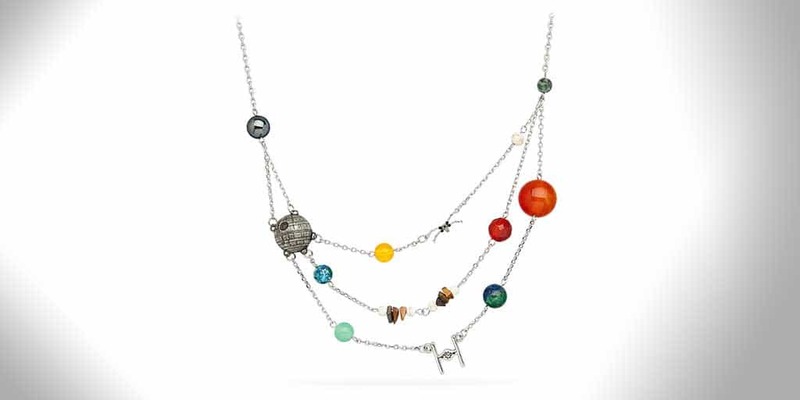 The stones uses for the planets are colorful and the necklace is well put-together, so it’ll look great with a variety of outfits in your wardrobe. It’s available right now exclusively at ThinkGeek, and it’ll make a great gift for the special Star Wars-loving lady in your life.